Villa Radicata has 5 bedrooms, 4 bathrooms, 2 living areas and 2 outdoor dining spaces both with magnificent views of the Tiber valley and lake monetedoglio. There is an outside pizza oven and private fenced pool. We have lots of toys and baby/toddler equipment, baby monitor cots and highchairs. Games and toys plus sky TV and internet.The restored farmhouse is on 3 spacious levels, set within 3 acres of private land and woods, including fruit, olive and nut trees. The beautiful surrounding countryside is ideal for walking cycling (mountain bikes provided), horse riding, or exploring the nearby Italian art treasures such as San Sepolcro (famous for piero della Francesca) or Caprese Michelangelo, birthplace of the famous artist. Nearby are golf and spa facilities. 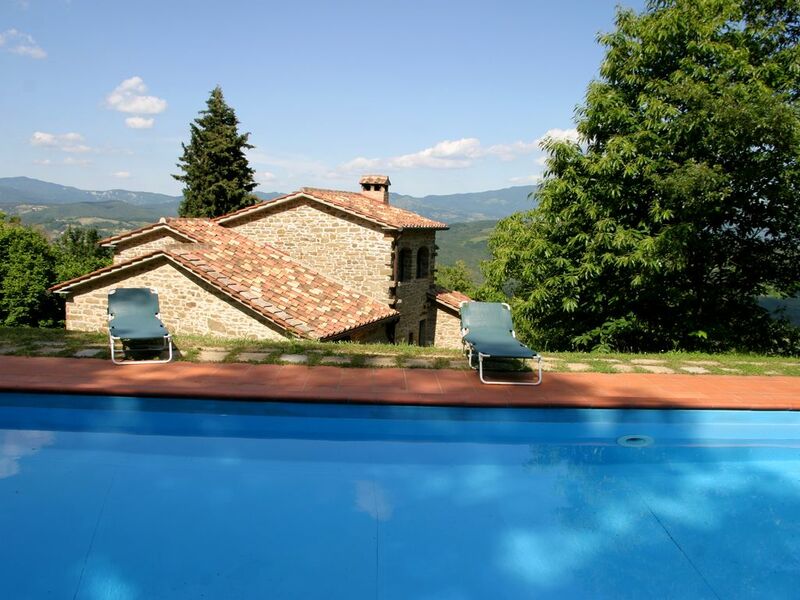 Within easy reach of Cortona, Assisi, Frorence, Siena and famous chianti vineyards. Shoe and wool outlet 20 minutes drive. Horseriding close by. We can organise pizza/pasta making lessons , yoga, massage and babysitting . Close by is a small deli where the local couple who own it make all their own bread, pasta,cakes etc . It is like going back in time as everything is kept the same as years back and the pace of life is slow . The house is very well set up for families with fenced pool, stair gates, baby monitor, cots , high chairs and plenty of toys and baby equipment . Babysitter available. We both have worked in tourism for many years, taking tourists around Italy. My family is Italian and it was always my dream to own a place in Italy. We spend as much time in Italy as we can and hope to move there. We have started doing cooking and yoga breaks here too. We love the beautiful scenery and the fantastic people. There is such a peaceful and relaxed atmosphere. We both fell in love with the house as soon as we saw it. There is something special about it and all our guests comment on how peaceful and relaxed they feel. It is great to drive down the lane and see boar, rabbits or deer. This is the real Tuscany. the people are fantastic and there are some great reasonably priced restaurants close to the villa. The scenery is stunning and Florence, Arezzo, Perugia, Assisi, Cortona can easily be reached. Our villa is peaceful and relaxing , great for a family get together , child friendly and easily accessible for day trips to Florence, siena, Arezzo , Cortona , Assisi etc. It is a safe unspoilt part of Tuscany and you feel like you have gone back in time. En-suite bathroom to bedroom 1 with spacious corner bath and wall mounted shower. En-suite bathroom to bedroom 2 with sunken bath and wall- mounted shower. Large En-suite shower in top bathroom. Twin rooms share bathroom with bath and shower. Notes on accommodation: The villa suits a large family or 2 families as it is on 3 levels and there is plenty of space. We have plenty of toys, games and dvds to entertain children, plus mountain bikes. There is paddling pool, slide, small tractor, swing for smaller children. We can arrange yoga lessons, pasta and pizza making, cook and babysitter. Plenty of great restaurants close by. Outside: Private pool 12x5m. 3 acres of garden and woods with fruit and nut trees. Pergola eating area with large table seating 12 and smaller ceramic table at kitchen terrace. Small 2 seater table on bedroom 3 terrace. Outdoor pizza oven and barbecue. 4 Mountain bikes are available for children(250 euros deposit required) and must be ordered a week before arrival.Plenty of toys. Utility Room: There is a washing machine in a large under stair cupboard, also ironing board and iron. Cleaning / Towels / Linen / Maid service: Cleaning service once a week. All linen, towels and pool towels provided and changed once a week. Other: Outside, by pergola dining area is an old fashioned, fully functional bread/pizza oven and barbecue. We had a wonderful pizza making evening with Laura and her husband, who is a chef you can invite to teach you to make pasta or pizza, truly an evening to remember. We had friends stay with for a few days and had truly Italian style eating experience, they were friendly knowledgeable and just so nice. You can scrump in the grounds for hazelnuts, walnuts, blackberries and apples. We saw wild boar, snakes (small one), lizards, squirrels, badgers. Being town folk we were not used to sounds of wildlife at night, we enjoyed it. Every morning you wake up have breakfast on the terrace you would be greeted with the most amazing view and every morning that view would be different always beautiful but eveyday different, of mountains and lakes of rainbows and sunsets and sunrise and ever changing weather conditions. A truly delightful experience Rita and her husband were very welcoming warm and friendly. Knowledgeable of the area and were extremely nice and helpful. I can highly recommend a stay at Villa Radicata. The location is ideal for a quiet relaxing stay with beautiful views or a short drive from the villa brings you to some beautiful towns with lovely markets and restaurants. The pool is great for some cooling off after a day sitting in the sun or walking in the towns. The house itself is beautifully presented with great facilities. Rooms are very comfortable. All in all, I was delighted with the holiday. We rented this out for all the family to meet and holiday together. What a fantastic find. This house is very authentic with marvelous views across at the mountains and a lake. This pool is a fabulous size , much bigger than ones we have had before. There is a lot of space here, both inside the house and outside in the garden. The nearby towns are beautiful and more real than a lot in Tuscany, a truly wonderful holiday. We had a cookery lesson and a yoga session , both of which were a marvelous addition to our holiday. A wonderful retreat for a family all together. My family and I stayed here Summer 2016. The house was a beautiful, rustic home full of all the mod cons we should require and loads of extras for the children. The pool was gorgeous and we truly felt we experienced the Tuscan lifestyle with our outdoor dining, visits to the local market in Arezzo and quaint festivals in Anghiari. Our hosts, Rita and Mike couldn't do enough for us - yet respected our privacy as and when required. Great to have onsite guides to advise, recommend and share local secrets with us. We've booked to return with our extended family for August 2018; can't wait! Thank you and look forward to seeing you and your beautiful family next year . What a beautiful spot! I just loved being on the side of the hill with amazing views over the lake in the distance. A holiday with my young son is normally tiring but here I got the peace and quiet occasionally that I so needed with Rita and Fernanda babysitting and cooking and I even lost some weight into the bargain. Just delightful! This was our second trip to Radicata, and we hope to bring the grandparents along next year. The settling is so blissfully peaceful, and the house is very spacious, light and packed with toys and equipment for the children. Ours particularly liked the slide outside. We all enjoyed lazy meals on the patio where we soaked up the view and the children chased the geckos. We even saw some wild boar! Great walks around lake montedoglio and visit markets of anghiari and San sepolcro, fantastic for art and museums too. Close to shoe outlets and designer outlets. 1 hour's drive to beaches of Adriatic coast. Perugia 1 hour drive. Forli 1 hour 20 mins drive. Bologna 1¾ hour’s drive. Florence 1and 1/2hours drive. Pisa 2½ hours drive. Rome 3 hours drive. Caprese Michelangelo 5km. Anghiari 15km. San Sepolcro 25km. Arezzo 35km. Cortona 70km. Siena 100km. Assisi 100km. Florence 120km. Rome 230km. Nearest small supermarket 1.5km (20 min walk). Nearest bank and pharmacy 5km. Large supermarkets and large town 20 min drive. Nearest bar, pizzeria, ice cream 1.5km. Great restaurants at Caprese, 5km away. Shoe outlet 15 min drive.Wool outlet 20 min drive. Big commercial centre and shopping mall at Arezzo 45 min drive.